Are you ready to get this party started? I am! Of a stranger at midnight's hour. "Why, I'm the ghost of a flower." Though I've seen the shade of a tree." 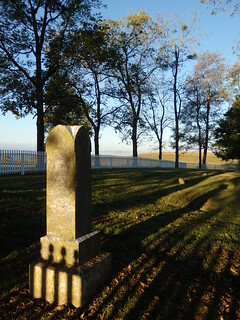 The Shaker graveyard was beautifully situated at the top of a hill. The rest of my photos from the trip are here. Now let's set the tone for the month with some chilling mood music. I just discovered violinist Samantha Gillogly last week at A Long-Expected Party 3, where I heard her play live and bought her CD. She's absolutely fantastic. Here is Samantha Gillogly with "Danse Macabre." To add to the Halloween goodness, here's an interesting Kickstarter. It's for a board game called This House is Haunted. While it's hardly the first haunted house board game, it has the unique concept where your house is the game board. That is really fun! (Thanks for sharing!) I love that you use your own house in the game. I've been looking forward to your Halloween Countdown. 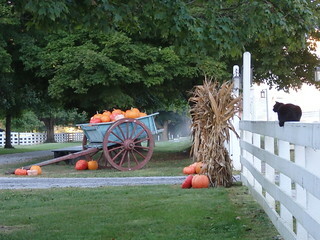 The pictures from the Shaker village set a perfect mood, especially the spider and the black cat. Love the violinist! Wishing you a shivery spooky month!! Hugs! Yeay! It's October! 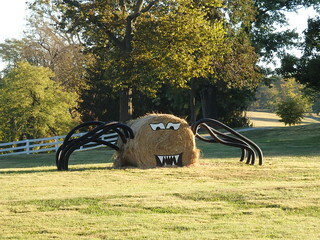 Great photos (and party, by the looks), especially the hay bale spider - what a picturesque spot. The Ghost of a Flower was lovely. And you posted violin music on the very day that I scribbled down the name of a violin teacher in town here - how spooky! *g* What a brilliant start to the month. Thank you - and happy October! Yay! Happy October to you! I'm so tickled that you liked the photos and poem. How fun! I love it when things fall together like that. And I admire you greatly for pursuing the violin. I really do love its sound. Thank *you* - and may your month be enjoyably spooktacular! Yay! I love this photo! What gorgeous colors. 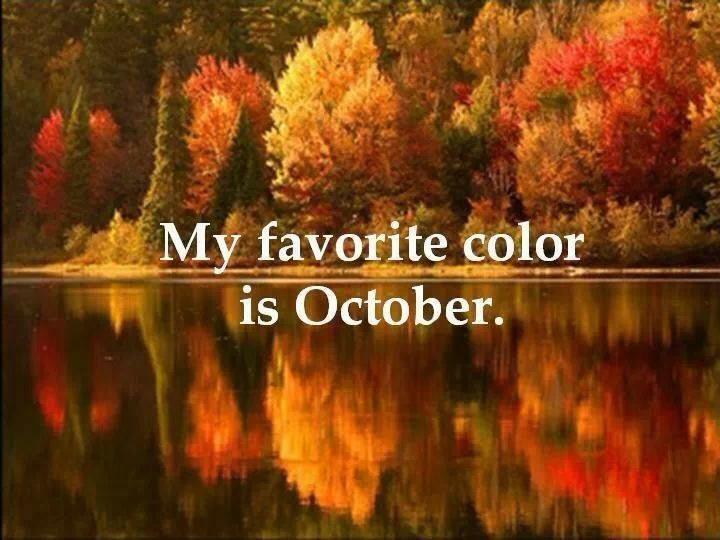 It's perfect: my favorite color *IS* October! Yay! Thanks so much for joining me for the countdown. May your October be spooktacular! I love the pictures, especially the spider. And a homage to the dwarves of Lord of the Rings! I can see why it would be a great place for a wedding. I'm so tickled that you like the photos. :) It was an amazing event in the absolute perfect setting. It couldn't have been better. Pretty song. Love me some dark and spooky violin playing. I also love the poem! Yay! Isn't the song perfect? I'm so glad you like it, too. The poem makes me smile. :) Happy October! Yay, back for another year of Halloween goodness! Looking forward to seeing what you have to offer us! Yay! Thank you for joining me! I hope you enjoy it. May your October be spooktacular! Oh, I love your Halloween posts so much! That poem is delightful and I'm saving that somewhere. Yay! I'm looking forward to your posts! And huge thanks for putting Shira Kammen on my radar. *flails in delight* Fantastic! 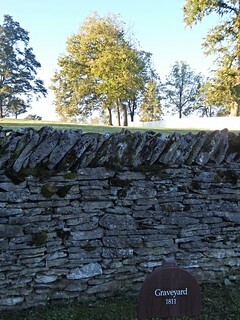 Yay, you started with Shaker Village pix! I love that place so much. Samantha does lovely music, I agree. Does she have another CD? Danse Macabre was not on the one I bought at the trading post. That is such an idyllic place! As far as I know, Samantha has the one CD (which we bought at the trading post), plus two singles, which are available on iTunes and as a download at Amazon, among other places. I bought those, too: one is this "Danse Macabre," and the other is the Tolkien-esque "Misty Mountain." Happy October to you, too! Aha, I shall look for that then.